Weeks one and two of my internship with Morrison Industries focused almost exclusively on introduction and preparation, most importantly undoing years of bad posture and technique. After an initial mobility assessment, this was accomplished through morning sessions of joint mobility drills, stretching, and squats, coupled with long walks or trips to the gym. Proper technique for exercises including deadlift, one and two-handed kettlebell swing, overhead press, Turkish getup, and different squat patterns and techniques were introduced. Additionally, I had some chiropractic and soft tissue work done, which helped to straighten my posture and improve my overall movement. Other notable skills, techniques, or information I learned include proper breathing techniques, lateral, forward, and backward rolling, using foam rollers, physical culture history, Flowfit and sitting in seiza. I, of course, am still improving upon much of this, while still being introduced to further knowledge. Like Morrison Industries, LTD on Facebook! Last Thursday, I braved two plane rides, a 3-and-a-half-hour layover in Atlanta, and two time zone changes to intern with Nathaniel Morrison of Morrison Industries, LTD for the next few months. The past few days has served as a sort of introduction/area familiarization along with some initial number crunching and testing to determine exactly where I am physically in addition to my medical history, dietary concerns, etc. 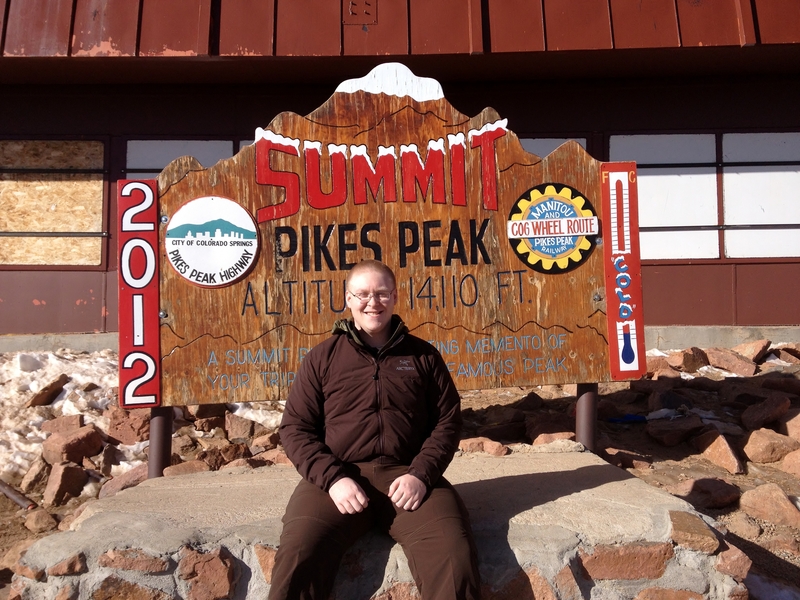 The highlight of those days was definitely the trip up to Pike’s Peak. I got some great photos. 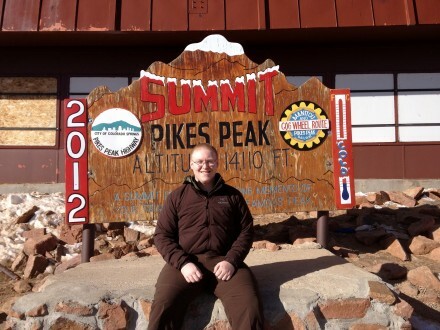 I also suffered a bit of hypoxia on the summit, which was easily cured with some carbs and a steady decrease in elevation. In any event, the real training starts today, so expect a full report next Monday, along with more photos. DTS is one of the first companies who’s products I wrote about, so I had a personal obligation to see what they had to offer at this year’s SHOT Show. 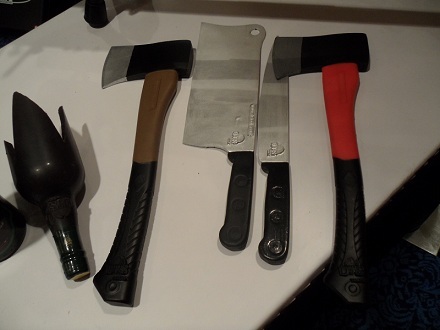 It turns out they’ve added more than a few new items to their line of training weaponry, including a butcher knife, kitchen knife, fireplace poker, and two color variants of a campfire hatchet, in brown and red. Additionally, they’ve finalized the design for the broken wine bottle from the prototype seen last year. 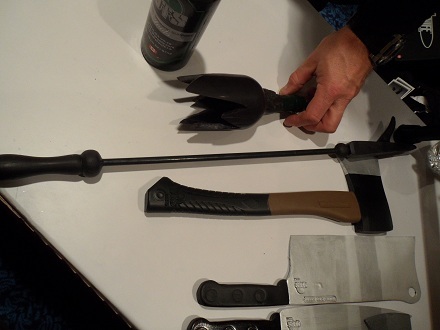 DTS Tools are designed to mimic many of the improvised weapons that LEOs can possibly face in the line of duty. They are built with a polymer insert designed to minimize impact and enhance safety and are surrounded by a lightweight, high quality, impact resistant rubber exterior, rated for temperatures ranging from -13F to 125F. 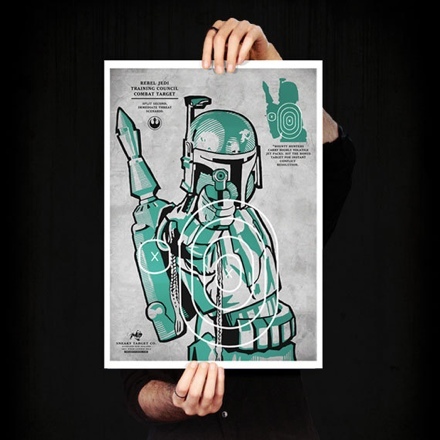 Sneaky Studios has designed a line of Star Wars themed target range posters. Characters include the Rancor, Darth Vader, a Stormtrooper taking Princess Leia as a hostage, and of course the man himself, Boba Fett. Each poster is a high-quality digital print on 220gsm premium paper stock, is signed by the artist, and will run you $35 a piece, so you might not want to plug holes in the originals. Luckily, this is exactly what local print shops (or office supply stores) exist for, right? Thanks to red2alpha73 for the tip! Title says it all. According to the video source this is a Chinese Army exercise, which in all honestly doesn’t surprise me that much. To the instructor’s credit, he was pretty calm about the whole thing. Check out this video of former SEAL and owner of Trident Fitness Rich Graham as he demonstrates how to shoot from a position of concealment from the back of a truck bed. The targets he’s shooting at are three StrikeMark SM-1 Auto-Reset Target Systems. The SureFire 100-round High-Capacity Magazine is constructed from Mil-Spec hard-anodized aluminum. It weights 3.3 lbs. (!) fully loaded, and has a length of 12.2 inches, so have fun trying to go prone. It features reliable functioning thanks to mechanical simplicity and high-quality, non-binding springs coated with cadmium for low friction and corrosion resistance. Any weapon that can accept STANAG 4179 compliant magazines can accept one of these. 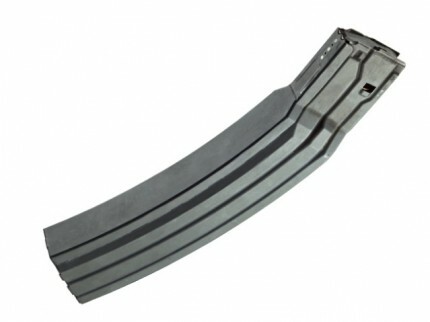 Specifications aside, can a magazine with this high a capacity actually work reliably? My initial analysis: yeah, it can. See, I was at a training class yesterday (more on that later) and I happened to bring a hi-cap mag along. 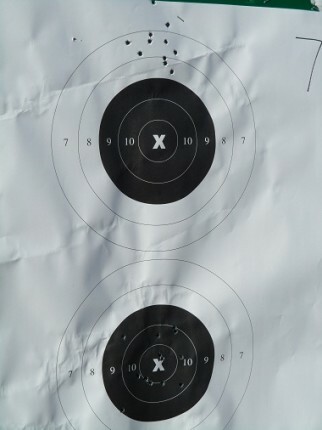 Not for the class, mind you, but because I was at the range and I finally had a chance to test it out. It took a long time to load, and it was heavy [said Captain Obvious], but it seated just fine and I had no feeding failures. I had a few of the other students try it out as well, so it went through multiple AR-15s from many different manufacturers, and still had no issues. I’d have to use it a few more times, and in different weapons, to be completely sure, but as it stands it’s my full belief that SureFire made a great product in this magazine. No, you’re not expected to jump that high when you first start. Box Jumps are an excellent plyometric exercise that works heavily on the lower body. Because of the explosive power and muscle contraction requred from that part of the body you’ll build strength fairly quickly and see an increase in jumping ability i.e. height. Now, I’ll be the first to admit my vertical isn’t great. I can’t use the standard boxes that are set up at the facility I use, even if its only by an inch or two. Instead, I stack a few weights up until they reach a slightly lower height and I’ve been working from there. That’s one of the best things about Box Jumps, though. They require no specialized equipment and can be done almost anywhere, at massive benefit. -Set up a box. If you don’t have a box handy, stack up a few weights, aerobics steps, or use a sturdy chair/bench. Work within your means and abilities. -Stand in front of the box, feet shoulder-width apart. -Jump on top of the box, planting both feet firmly on the surface. -Hold for roughly a second, then jump down, bending your knees as you land. -Repeat explosive movement as necessary. If you’re finding your jumps too easy, don’t forget you can add more height, carry weights while you jump, and/or try other variants, like Box Jump Burpees, for a more gainful and intense exercise. I highly recommend trying Box Jumps out if you haven’t already. Having recently started CrossFit, I can safely say I’m getting a good workout every session. To celebrate this, each week I’d like to introduce one of the various exercises we… endure. And where better to start than the classic burpee? Origins according to Wikipedia: According to the Oxford English Dictionary, the exercise was named in the 1930s for American psychologist Royal H. Burpee, who developed the Burpee test. Consisting of a series of the exercises performed in rapid succession, the test was meant to measure agility and coordination. It is not clear whether the exercise itself was invented by Burpee, or if his test merely popularized it. I can’t personally confirm the statement above (it is Wikipedia, the encyclopedia anyone can edit after all), but I think it goes without saying that whoever developed the burpee was obviously more machine than man. For those not in the know: you start in a squat position, hands on the floor in front of you. Next, you kick your feet back to a pushup position, then immediately return to the squat position. From there, you leap into the air, as high as you can. Repeat as necessary. Basically, done right burpees are one of the best, most exhausting exercises anyone can do. Plus, with all the variations available, such as one-handed burpees and pull-up burpees, there’s potentially no part of your body burpees can’t work out. Give them a shot if you haven’t already. The results may surprise you. Where Is Zombie Cookie Monster Now? 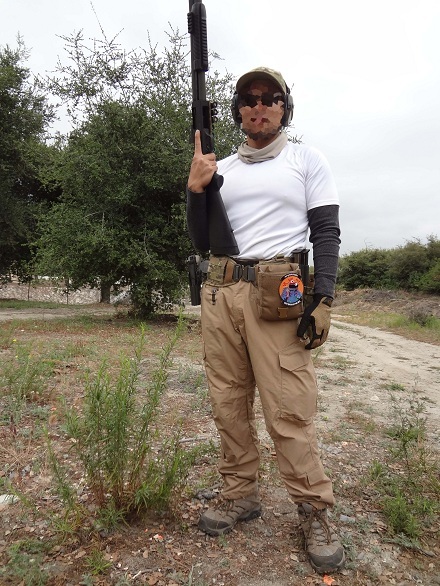 For those who forgot, I held the first ever ‘TFB Caption Contest’ and the winner was announced last month, the awesome fellow posing in the pic above, Mr. Shane Sasaki at a recent tactical shotgun class. Thanks for spreading the word of TFB and SSD, Shane! For everyone else, stay tuned, as you never know when I’ll pop up with something else cool to give away. Posted in Contests, Training, Zombies | Comments Off on Where Is Zombie Cookie Monster Now? Norwegian troops with G3 variant rifles were training when the throw man doesn’t quite make it with his flashbang. This is exactly the kind of thing training is for, and hey, they got a good laugh out of it. I know I did :). 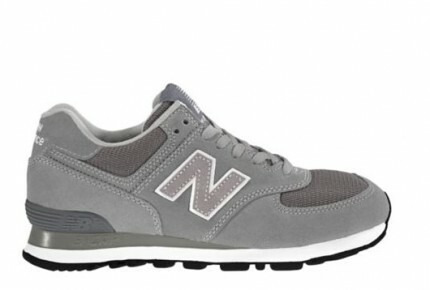 Do you like New Balance running shoes, but never really found a pair quite to your liking, style wise? 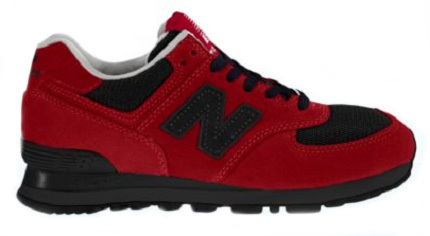 Luckily, New Balance now offers a full customizable version of their 574 running shoe via their website. Simply go through the options of the base, upper, heel, and accents to alter each individual part of the 574 color-wise. The viewer alters the shoe model in real-time, so you can see what your changes would look like on the final product. Plus, you can personalize your shoe with special embroidery on the heel, up to eight characters. Finally, each custom pair is made in the good old U.S.A.
visit shopnewbalance.com to get started with your own pair. An Intro: I’ve had some previous experience with the M4 before, but this was the first class I took that was completely devoted to its operation. Even though it was only two days long, I still managed to pull a lot of useful information that I will definitely be using in the future. In any event, if you’re new to the carbine, or just want to polish up some skills, this is an excellent class to take. The Instructor: Jason Falla has 6 years experience in the Australian commando regiment and a further six years in SASR. He has prior experience in counter terrorist operation, heavy weaponry, combat medicine, CQB, special reconnaissance and surveillance, and hostage rescue. In 2005, Jason relocated to the USA and worked for Blackwater for a period of 5 years as a firearms instructor before starting Redback One where he became the senior instructor and training advisor. 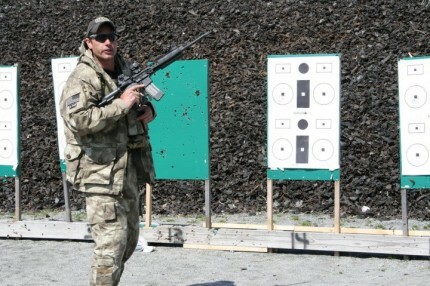 His years of experience and mastery of the carbine really showed through his instruction. The Weather: The first day was pretty chilly, and it stayed that way pretty much the entire day. The morning started cloudy with a light sprinkle, but thankfully this didn’t last. It definitely helped that we spend most of the day in the classroom, but more on that later. The second day was also fairly cold. It warmed up a bit as the day progressed, but a jacket was not unwelcome. Also, plenty of afternoon sun led to plenty of sunburn after the second day. What can I say? Blame my Nordic European ancestry. My equipment: I used a Daniel Defense M4 with a DD forward grip, Magpul ACS stock, Blue Force Gear Vickers Combat Applications Sling, Surefire Scout Light with Manta Rails to hold the pressure switch, and an Aimpoint Patrol Rifle Optic. For my choice of magazines I used Magpul PMAGs. For the purposes of the exercises, each mag was filled to 28 rounds. 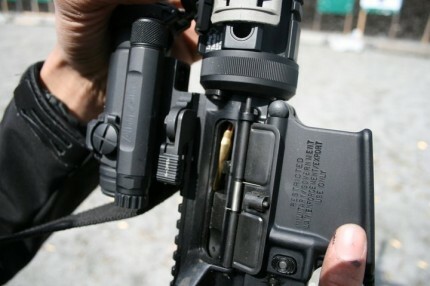 I also used a Crye Precision Mag Clip for one of my mags, which I held on the left shoulder strap of my rig. 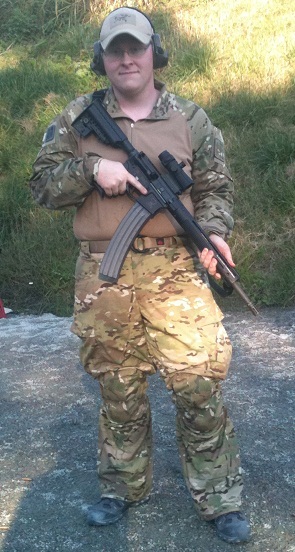 My rig is a Tactical Tailor 2 piece MAV complete with an X Harness, both in MultiCam, of course. We were in the classroom for about 7 hours (including the lunch break). That’s not to say it felt like wasted time. 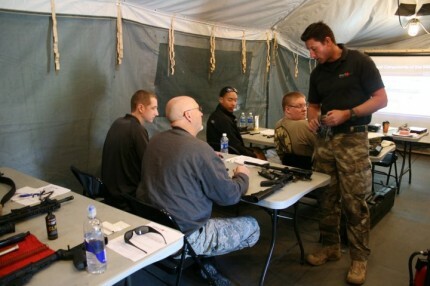 Actually, the lessons were quite informative, starting with the training objectives and leading into topics like M4 safety, characteristics of the M4 platform, the cycle of operation, how to field strip your rifle, shooting fundamentals, and zeroing. It’s definitely a great introduction for someone who’s new to the M4. When 1500 rolled around, we did a bit of shooting. Mostly zeroing our sights from the 25m line. After an hour and a half of zeroing and confirming our zero, we fired at low percentage targets from the high and low ready positions with follow through and post engagement exercises. That ended the day. More classroom! But it was only 30 minutes long. And it was about ballistics. Having a good understanding of how the combination of your rifle and chosen ammunition affects a target is very important information. FYI, be on the lookout for Barnes Triple Shock. Best round ever [for now]. -Shooting at high and low percentage targets at 7 meters. A good warm up for the exercises to come. 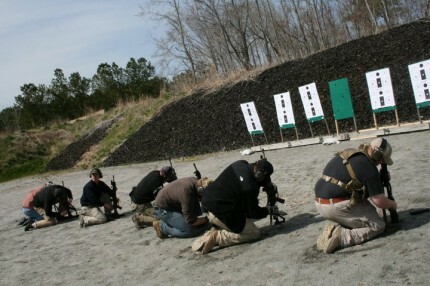 -Shooting from the standing, kneeling, and prone shooting positions, and the pros and cons of each. We also worked a bit on alternative stances, such as rolling from prone. -Tactical reloading. We went over this extensively. -Cadence drills. Shots at 1 sec, 1/2 sec, and 1/4 sec from 7m. This is where stance and trigger control really come into play. This was also the last exercise before lunch. -My personal favorite, the malfunction drills. We worked on failure to feed, unseated mags, failure to extract, double feeds, and the biggest malfunction of them all: bolt override. Mortar that rifle, soldier! -Turning drills. Pivoting left and right towards the threat. About turns towards the threat. This also doubled as an exercise in shooting weak side dominant. You can’t always have your left foot forward, after all. -Shooting on the move, specifically while moving forward. You sacrifice a stable shooting platform, so keeping good control is all the more important. -Shooting from cover at steel. We devoted quite a few rounds to this, about one mag per cover. 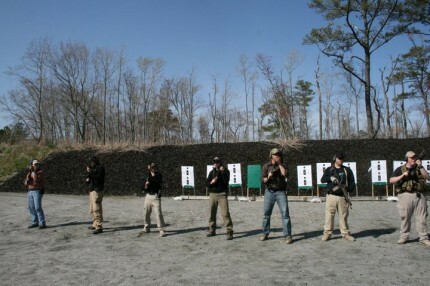 We practiced leaning from cover, shooting under cover, shooting above cover, ect. As predicted, some of the students took a few pieces of the cover off. Not a big deal in training, but it’s always important to remember when shooting that you’re optic has about a 2in. offset from your barrel. -The final exercise of the day was a qualifier from the 50m line. 50 rounds, 5 points within the target, 3 points if the shots hit the body outside the target, same with headshots when the exercise called for them, 250 max score. The shots were made from various positions at various distances. We advanced to the 7m line. I managed a 210. Yea, me! 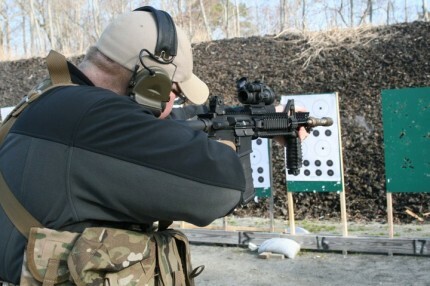 If you’re interested in attending this or other firearms classes, visit redbackone.com to view their available training schedule. Also, thanks to Redback One’s facebook for many of the photos used in the article. You can view them and plenty more here. Also, I really want one of those Saiga-12s. 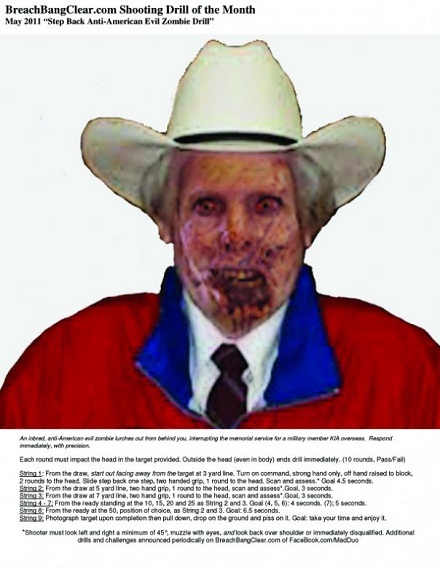 Anything that can shoot a creepy looking mannequin in half is a definite must-have. Visit http://www.bhigear.com/ for the full selection of Blackheart International gear. 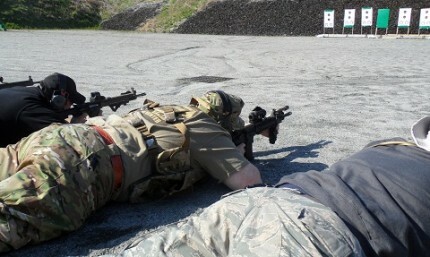 I attended Red Back One’s 2-day tactical pistol course last Saturday and Sunday. Despite the limited class time, I did find an improvement in my fundamental skills and I learned a few new tricks along the way. 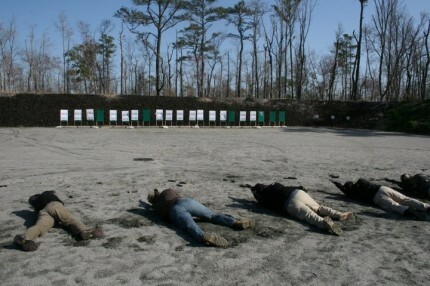 Basic loading, malfunction, and shooting drills make up a majority of the class. 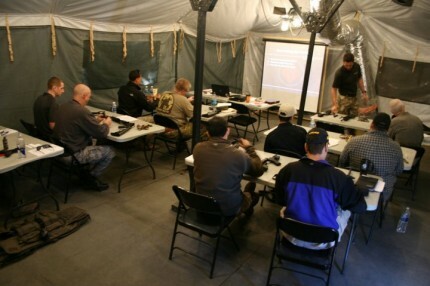 However, being a tactical pistol course, it also includes advanced level skills such as how to properly shoot from multiple levels of cover. I found the class very informative, and am likely to use Red Back One for any future training courses. I highly recommend them. Also, the course overview recommends 800 rounds for the class. I recommend a minimum of 1200 rounds, since I came out empty, and I brought 1000. Visit Red Back One to see all their available training classes. Look for a more detailed after-action report of the class later this week.